while Yes and No chase each other around the circumference. We say that someone has the wondrous ability to play the zither or the lute, but if we ask where that art resides, not even the wisest man can answer....This art, produced by something we cannot fully know, is like the innate nature of the mind that operates in all our daily activities. Tomorrow is a day of considerable spiritual significance. It is Yom Hashoah, a solemn day of remembrance of the Holocaust. It is Cinco De Mayo, another celebration of the dead that can jar the outsider with its often festive atmosphere. In Mexico it also marks the defeat of French forces there in 1862. 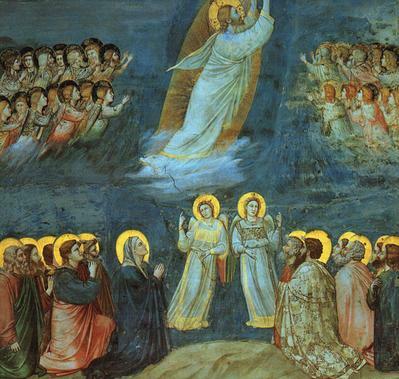 And it is Ascension Day throughout most of Christendom. For many Christians the picture of an actual and tangible living body of Christ rising up into the air to be with the Father in Heaven overhead is a bit of a reach...but perhaps it always has been so. I find myself thinking of these things as I reread the latest folio of poems to arrive the other day from my teacher and mentor, John Tagliabue. Approaching 82, Tagliabue, once so quick and light, now is slow...but still and always light. He is not allowing himself to be slow enough yet, for he says that again he has fallen...this time breaking his left arm and elbow. But he writes on in longhand, and must have to peck out the poems on his typewriter with extra difficulty. He must do it everyday, it is his instinct, his nature. He still refuses to use a computer to write or send out poems to friends---just as he always refused to learn to drive a car. He gets others to do these things for him...and I'm a guy he's glad shares his work out into the world, like apple blossoms showering upon us. "The universes & we have the lives of flowers. We blossom, wilt, change. Sure we pray, sing, doubt, etc etc as we change. And beyond the change of seasons, the various stages of our game, our more or less vitality, what do we know? For me my poems give some of the answers. Are they answers or songs. Kiss a doubt or joy as it flies---& live in eternity; sunrise. Sensible sensational wise dramatic Shakespeare stayed within certain limits. But can a physicist or philosopher define a limit? I wouldn't try to do that though especially in old age I sure know I have my limitations. Natural---as a flower or bee. To buzz or not to buzz. I buzz while I can. Now back to my stimulating reading; I seek stimulation as a youth seeks a bride, as a poem seeks a poet; and here I am seeking to stimulate a response from you." I believe that Krishna with one finger has lifted the world up. "I had written other notes and poems praising Mark Van Doren after I heard his lectures about Homer, Dante, Shakespeare, Yeats and others while a student at Columbia (1941-45) and later when Grace and I met him in NYC and a few months before his death in Connecticut. What follows was written just a few weeks ago (2005). Then I started reading the 1973 issue of VOYAGES published the year after Mark's death; it includes writings about him by Archibald MacLeish, Allen Tate, Allen Ginsberg, Mortimer Adler, Donald Keene and others. And it includes my journal responses to Mark's THAT SHINING PLACE. I like what Keene reminds us: 'Mark remarked once in class, in connection with some passage in Saint Augustine that no action was more specifically human than to praise.'" station and figure out its "meaning"? are going to stop sometime, I guess. before time must have a stop. In these insane times of ours it's good to know that, like the grass, there are people out there who are unmoved by the violence and madness, but who still offer a simple beauty. Something perenial and persistent. And which allows us to set aside the madness and think of simple things for a time. That is what poetry and art have always done. And when the horror appears in art it somehow becomes endurable. Why? I don't know. For it is a mystery. Perhaps a form of worship.